Leroy "Shakey" McGee is a former archery bronze medalist. 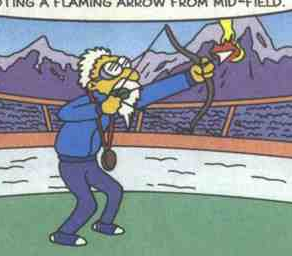 He was the man that lit the torch and brazier of the Montgomery Burns Winter Games and Montgomery Burns Games, respectively, by shooting a flaming arrow from mid-field. Both times he missed and set fire on Mayor Quimby's bag so they used a match instead. He won a bronze in both the 1920 and 1930 Olympics. Modified on November 11, 2016, at 10:12.